RICHARDSON, Texas – The American Southwest Conference Directors of Athletics recognized dedication to service within the campus and local communities and selected LeTourneau University baseball athlete Gonzalo Sosa as one of two recipients of the 2017-18 Community Service Award. The ASC Community Service Award is presented for the ninth time this year and honors a male and female student-athlete who best displays leadership and action in fostering community service on their campus and the local community. Each ASC member institution has the opportunity to nominate student-athletes to the conference-wide ballot. Sosa, who will graduate with a degree in Business Administration from LeTourneau following the fall 2018 semester, was a part of the semi-annual Longview Green and Clean, a city-wide day that occurs twice a year with the street cleanup of adopted roads by organizations. Sosa also helped with the collection and donation of supplies to families following Hurricane Harvey this past fall and had spent time at both Texas Children’s Hospital and Shriners Hospital to donate toys to children with special needs and in the recovery of severe injuries. Sosa also participated in lawn maintenance and cleaning of homes for the elderly, as well as participation in special events with the YMCA and annual baseball fundraisers supporting breast cancer awareness. Sosa was also an All-ASC First Team baseball player and Academic All-Conference selection. “The amount of involvement by the award nominees and their fellow student-athletes over the course of the year is remarkable, and our member campuses and communities benefit from the interest the student-athletes have in bettering lives of others,” said Amy Carlton, ASC commissioner. 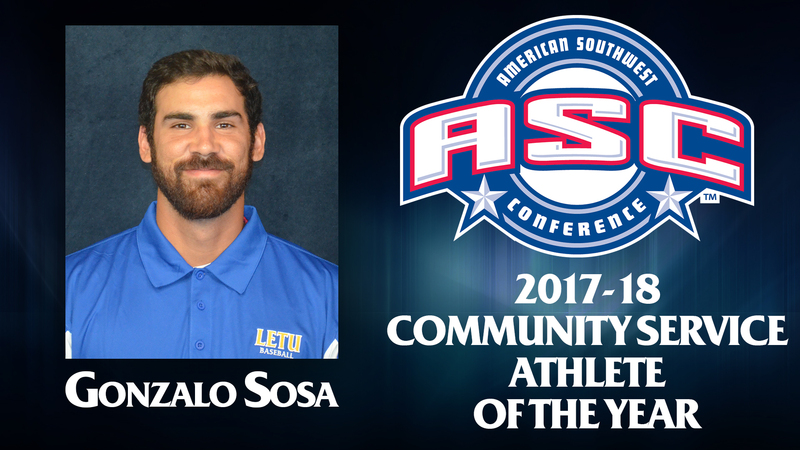 With the award, Sosa becomes the first recipient from LeTourneau to be named ASC Community Service Athlete of the Year in the nine-year history of the award.